For 2017: I’ll continue to surround myself with people who are smarter than me, and I’ll aim to be better about sharing my own knowledge. Since 2011, working with A Book Apart was my way of contributing to the design community while my own direction as a designer was uncertain. Over the course of 2016, as my new job at ProPublica restored my enthusiasm for design, I wanted to get back to working on my own projects and sharing what I learned in the process. Making time for that meant something had to give, so after producing the paperback/PDF versions of more than two dozen books over the course of six years, I stepped away from A Book Apart early in 2017. I was sad to go, but I’m happy to report that the time it freed up has been well spent. Getting back in the habit of sharing thoughts and projects publicly meant ending my personal site’s hibernation. For the new version, built with Jekyll, I developed a design system with a lot of options. The core template ably accommodates most posts, but when the occasion calls for something special, the system has the flexibility to completely customize individual posts with minimal friction. I’ve already written ⅔ of a series documenting some of the concepts and processes behind that system, which I hope will be useful for other designers. Having my site up and running again and getting back to blogging in earnest was the highlight of my year. 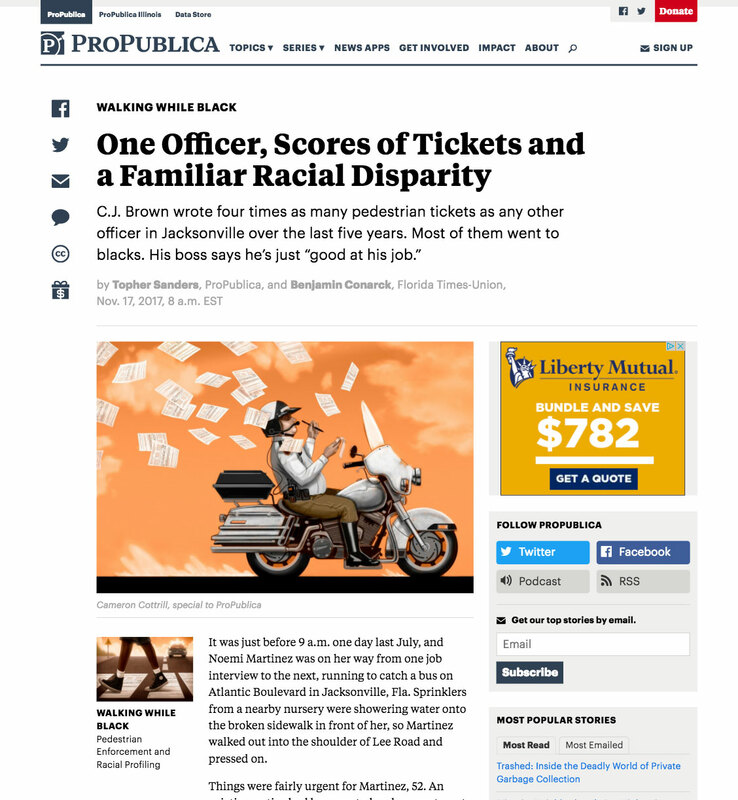 Work on my new site dominated many evenings and weekends, but most of my days were spent revamping ProPublica.org’s front end. We didn’t alter the fundamental design significantly, but we revised the logo, spruced up the typography, and aligned the layout with a new, properly responsive grid system, creating all new HTML and CSS from scratch. The new codebase sets the stage for us to make incremental improvements much more easily than we could in the past, so going forward, the site will be increasingly in step with the evolving demands of our audience. In the process of rebuilding ProPublica.org, I created a Sass tool called Column Setter, which takes the headache out of using grid systems in web design. It will be open source in a matter of days is open source! 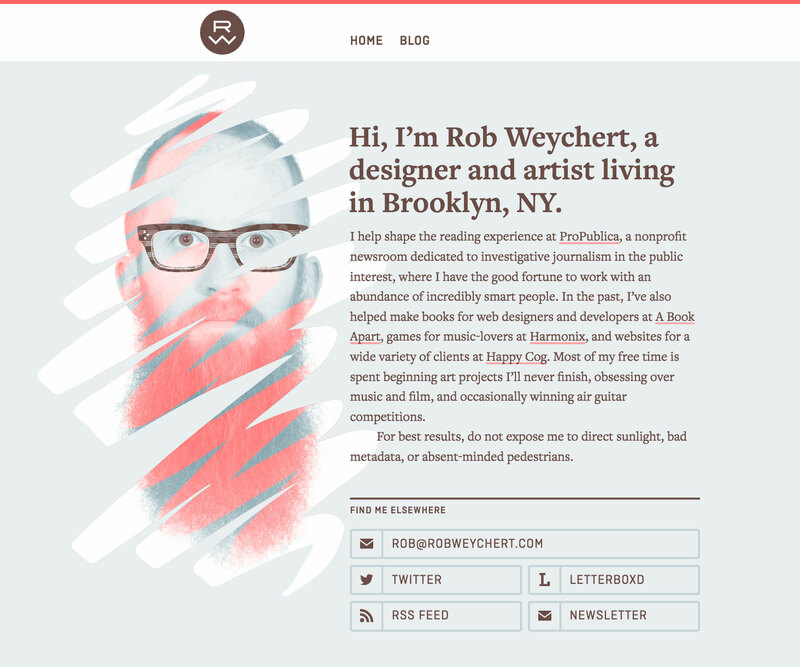 Read about how I’m using it on my personal site. Other than the main site’s realignment, the most significant ProPublica project I worked on in 2017 was “Lost Mothers.” The U.S. has the highest rate of maternal mortality in the developed world, and “Lost Mothers” identifies 134 of the estimated 700–900 American women who died from pregnancy-related causes in 2016. 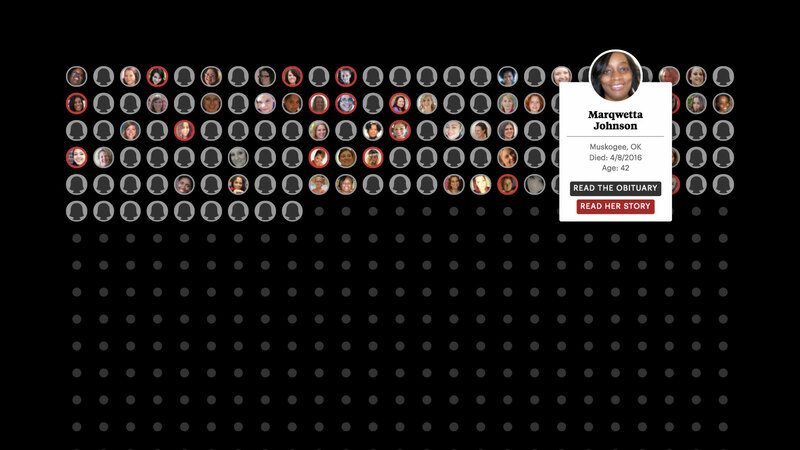 A chronological interactive gallery at the top lets you learn more about each woman’s fate, and the heartbreaking stories of 12 of them are profiled in depth. In June, I took an inspiring four-day Drawbot workshop at Typographics 2017 taught by the brilliant Just van Rossum. This was my overdue introduction to programming in Python, which Drawbot uses to generate vector drawings and animations. As is often the case when I delve into programming, I lament how little high school math I’ve retained, but the workshop got me far enough to build a framework for an exciting art project I’m planning to focus on in 2018. I linked to 117 distinct sites. I have paid subscriptions to the top three and I’m employed by the fourth, so no surprises there. The remainder of the top ten are either sites I follow closely or are popular publishing platforms, with the exception of The New Yorker , which I was recently surprised to discover I didn’t even follow on Twitter. I’ve since rectified that by following and subscribing, so it’ll probably see a bump on 2018’s list. All my favorite new music in 2017 was made by artists who were either new to me or new to my music collection (which is also true of the headliners of nine of the 16 shows I went to). So I’m glad I’m not leaning too hard on legacy artists as I get older, even if several of my 2017 faves have a decidedly retro bent. I wish it were a more varied field—there’s a lot of white dudes making a racket with electric guitars—so I’ll have to make more of an effort to branch out in 2018. If you weren’t around in the mid-’90s, when bands like Velocity Girl, That Dog, and Veruca Salt were making noisy, hook-laden indie pop just below the surface of the angsty mainstream, Charly Bliss is here to show you what you missed. I’ll admit Eva Hendricks’ candied lead vocals stirred my inner curmudgeon a bit at first, but the band’s songcraft and overall raucous exuberance melted my ambivalence pretty quickly. Pitchfork contributor Matt Grosinger aptly describes the experience of listening to Palm as “a lot like trying to understand people quarreling in a language you don’t understand.” Palm shares sonic DNA with Don Caballero and other math rock stalwarts from two decades past, but creates a strain all its own. In the age of poptimism, when millionaire megastars’ minor creative risks are routinely trumpeted as cultural watersheds, I’m relieved to see young musicians pursuing truly unorthodox avenues like this. Pissed Jeans are the purveyors of a grimy punk rock that’s equal parts amusing and unnerving. Their incisive observations of modern mundanity are goofy but nonetheless thick with existential dread. I’ve been an admirer for years, but none of their records quite clicked with me until this one. They also put on one of the best live shows I saw all year. If someone told me this record came out in 1980, I would have believed them without hesitation. Its angular, jittery post-punk recalls early Devo, with a Cold War cloud hanging over its pronounced sarcasm. But rather than being an undiscovered relic of Reagan-era discontent, All of Them Naturals is the late-2016 sophomore release from a mysterious band of Minnesotans calling themselves Uranium Club. The band keeps a low profile, but if its self-promotional acumen is (probably purposely) subpar, its tunesmithery is not. With glass-cutting guitars carving unexpected paths atop staccato rhythms, its debt to another era doesn’t prevent it from being inventive, unpredictable, and danceable, making Uranium Club my favorite musical discovery of 2017. White Reaper’s first two slabs of energetic garage rock caught my attention, but this record is the one that finally held it. Easing up on the self-titled EP’s youthful abandon and doubling down on White Reaper Does It Again ’s flirtations with polished arena rock, The World’s Best American Band is recommended for tailgaters who’d rather stay in the parking lot and skip the game. Beginning with its tongue twister of a title, everything points to Yowie’s Synchromysticism being an exhausting listen. The band’s own description of the record, touting its use of “signal detection theory and delusional mood to convey complex phenomenological concepts in a highly visceral form” is an eye-roller, to be sure, and its high-concept nature is evident in its knotty polyrhythms. But somehow the band wrings its seemingly self-indulgent compositional thicket of dissonant guitars and drums into a uniquely compelling sound. It’s like a carnival ride designed by an alien: rickety and dizzying in a familiar way at first, but soon revealed to have a mutated interpretation of what you expect it to be. I saw 37 new films. There are several promising ones I haven’t managed to see yet ( Phantom Thread , Blade Runner 2049 ), and some I’d like to revisit ( Get Out ), but at the end of the year, I had just a handful of favorites. Appropriately for the year of the Women’s March and #MeToo, my favorites are mostly about women. Though its lush 35 mm cinematography is a prominent tell, it’s easy to forget that The Florida Project isn’t a documentary. Its child’s perspective gives it a dominant levity, but one that amplifies—rather than undermines—the gravity of the entrenched poverty on display. It’s an impressive feat, and a remarkably compassionate film. Even if this particular story is fiction, it’s an all-too-rare opportunity to better understand some of the people hit hardest by real-life economic inequality. My favorite film of the year. See my original review. Movie teens are too often written as the sophisticated iconoclasts their adult writers wish they could have been, with a strong identity calcified at a young age. One of my favorite things about Lady Bird is that it allows enthusiasms for Bikini Kill, musical theater, and a good cry over a Dave Matthews song to coexist in its title character. She’s not an archetype, just like most kids aren’t, in spite of their tribal aspirations. She goes through many of the motions one would expect in a coming-of-age story, but the film’s quick pace—most scenes don’t last longer than a minute or two—packs in enough little details to give it uncommon dimension and warmth. The French have an unparalleled knack for transcendent gore, employing outlandish heaps of violence and viscera in service of storytelling that often achieves an intellectual and emotional resonance beyond cheap thrills. I’m a fan of many of the stomach-turning films stuck with the “New French Extremity” tag, but Raw might be my new favorite. An arresting depiction of the tangle of competing stimuli that accompanies a young person’s first taste of autonomy, Raw is made all the richer by throwing cannibalism into the mix. See my original review. My initial take on The Last Jedi was mainly that it was very similar to The Empire Strikes Back (in a good way). I thought I could just leave it at that, but I ultimately allowed myself to be absorbed by all the online chatter from critics and fans, some of which is quite thought-provoking. My thoughts on the film are pretty jumbled at this point and I’ll be really curious to see how it holds up on a second viewing, but for now, I remember enjoying it enough to include it here. See my original review. I’ve long had a bad habit of excitedly talking up ideas I never get around to actually executing, and in recent years I’ve tried to do a better job of keeping my mouth shut until I have something to show. The list below of my creative goals for 2018 runs counter to that effort, but I feel good about my momentum lately, and I like the idea of having this document against which to hold myself accountable. We’ll see how it goes! This one is already well underway. I honed the concept and UX with a user-tested prototype awhile back; most of the data is wrangled and formatted; and the back end is nearly complete. The front end will be my first foray into CSS Grid layout. I’m hoping this site will spur me to write about music more often, but even if that doesn’t happen, it’s still a pretty cool database. Initially inspired by the recent proliferation of GIF art, and a renewed interest in the paradoxical isometric geometry of M.C. Escher, I started sketching out ideas for a series of animations and prints a couple summers ago when I was laid up with a sprained ankle. After spending more time with the systemic work of Sol Lewitt (thanks to the aforementioned museums) and seeing the possibilities inherent in Drawbot (thanks to the aforementioned workshop), the concept has evolved into something more musical, and it’s coming into focus more each day. Frustrated by the shortcomings of exported SVG (accessibility issues, non-responsiveness, bad text formatting), I’m working on a tool that turns simple CSV data sets into semantic HTML tables styled as responsive bar charts. There are plenty of challenges ahead, but I’ve already built a basic working version as a Jekyll include, the fruits of which can be seen in the Links and Film sections of this very post. 2018 is the 10th anniversary of my air guitar alter-ego’s first competition. Will he come out of retirement? For 2018, I’m aiming to get out of the habit of waiting for optimal conditions before acting. The water will never be fine. Just jump in.